Home » Blog » Starting from Scratch(Bikes)! It’s been a long-time coming but low and behold – Newcastle upon Tyne finally gets its very own cycle-hire scheme in the form of ScratchBikes and the brains behind the operation, Robert Grisdale and Jack Payne, chose to partner up with Kino Creative to develop the company website and part of the bike hire/unlock system. We collaborated with @hazzus (Scratch Bikes chief designer) and SquareOne Technologies (SMS gateway service) to develop a site with all manner of goodness including tiered subscription fee payments integrated with Paypal, a two-way API system with the SMS text service responsible for unlocking the bikes and a Google Maps “Bike Totalizer” which allows ScratchBikes to show on their website, how many bikes are located at each of the 35 racks around the city – and this was all wrapped up in a super-friendly content-managed WordPress website. Cycle-hire schemes are growing in popularity, can be found in a number of cities around the UK and Europe and they are great for the environment. 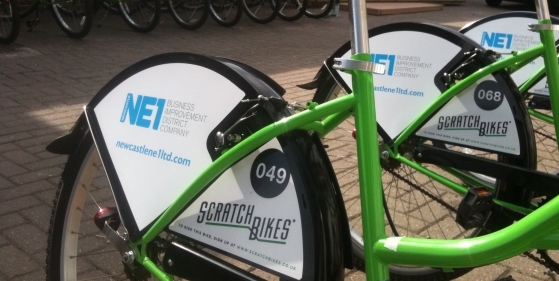 We wish Scratch Bikes the best of luck with their venture and are thrilled to be involved with such an interesting project with the potential to make a city-wide impact.